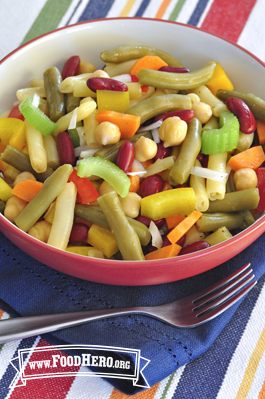 4 Comments for "Bean Salad"
I also used rice vinegar and it was great! I omitted the sugar altogether and it was very well liked by my fourth graders. I made this salad using various kinds of beans along with onion, carrots and celery. I found that this salad tasted very bland while using vinegar. I substituted the vinegar fror rice vinegar. Rice vinegar tends to cling on to the vegetables rather than washing out the flavor with vinegar. I also cut down on the sugar from a 1/4 to 2 tablespoons. With these two modifications this recipe was adult, senior and child liked! Very tasty! Kids and adults have approved! Adding some raw diced carrot, celery and finely minced green onion put more color and nutrients into the salad. It was even better on day two! Very good! So easy to make and not too vinegary like a lot of bean salads. I used green beans, lima beans, garbanzos, and red kidney beans for mine with some finely diced sweet onion and red bell pepper. Great salad for warm weather and a great way to get your vegetables and fiber.